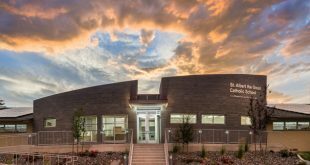 The Stanislaus County Day Reporting Center received an award from the Concrete Masonry Association of California and Nevada (CMACN) and the American Institute of Architects, California Council’s (AIACC) 2017 Concrete Masonry Design Awards. 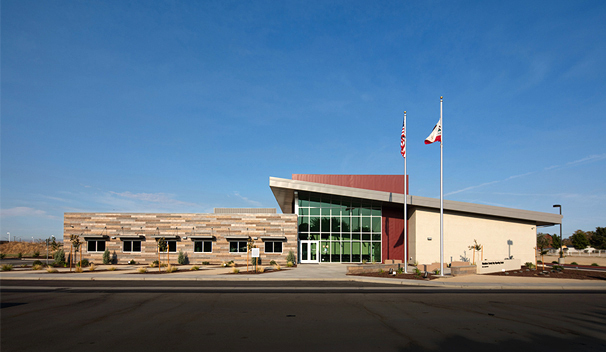 Located within the larger Public Safety Center campus, the Day Reporting Center is a public safety facility that is intended to help people get their lives back on track after release from custody. Made up of three independent public safety departments; probation, sheriff, and Behavioral Health, the DRC does not house a permanent custodial population. Rather it serves as a gathering and educational place for people who have recently been released from custody. Architecturally and programmatically, this 14,000 sf facility can be broken down into 3 main program elements; staff, public, educational. In a homage to the reverse nature of the DRC, inviting those released from custody back to the Public Safety Campus, the staff is housed in the main CMU portion, while the educational and public components are on the opposite side. Due to its extreme durability, ease of maintenance and its ability to respond to the overall public safety center’s architectural context, CMU was a natural choice as one of the facilities primary building materials. The CMU consists of a repeating pattern made up of 3 separate colors, each with a ground face and split faced finish. However, when placed, it has the appearance of a random pattern. The result was a look of a variegated mass that not only anchors the building, but also provides substantial visual interest. Within the interior, the pattern was retained but only ground face units were used, still creating a visual mosaic. Interior clerestory windows wash the interior CMU walls with natural light and highlights subtle differences in the aggregates. The use of CMU was a logical choice to help with the interior environmental systems. The large mass of the CMU helps provide a thermal lag to help mitigate the effects of the hot Central Valley sun.